Not sailed in Ireland but looking remarkably similar to our own sadly depleted Dublin Bay Mermaid class, the Essex based Brightlingsea One Design (BOD) Class – a classic 18-foot three-man clinker dayboat which has been sailed continuously at Brightlingsea since its introduction in 1927 – is going from strength to strength and continues to expand. Easter Friday 25th March saw the launch of the very latest addition to the fleet, C65 Never Say Never. With GRP mouldings by White Formula and woodwork and fit out by Simon Hipkin Boat Builder for owner Geoff Gritton, Never Say Never is without doubt the most innovative BOD built to date and a large crowd gathered to celebrate her naming. For years Geoff, who is perhaps best known in the sailing world as the owner of Quarter Tonner Panic, had joked with his BOD sailing friends that he wouldn't be caught dead in one. But in 2015 a friend persuaded him to race a BOD seriously for the first time and the scales fell from his eyes! "I'm used to the cut and thrust of Quarter Tonners, which without doubt offer some of the closest keelboat competition you could hope to find, but the BOD fleet has an incredible depth of talent with multiple World, Continental and National Champions and even the odd Olympian racing on a regular basis. To have such incredible racing on my doorstep persuaded me that it was time to join the fun. And after everything I've said about the BODs over the years Never Say Never really was the only choice when it came to the name!" "Coming from a sports and big boat sailing background I was keen to introduce some of the developments in fit out that I've seen in other classes. My first call was to BOD Measurer David Chivers, as whilst I wanted to take advantage of what I've learnt from other classes, I equally wanted maintain the ethos of the class and the traditional style of the boat. "Many of the innovations are really just a natural progression in boat equipment and materials. 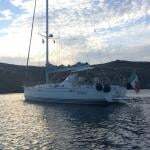 For example, the boat has only three hard shackles - the main halyard as it's locking, the jib tack and centreboard - everything else is soft attach, including all blocks. "It's been an exciting time, working so closely with Simon Hipkin who has brought my ideas to fruition and fine tuned them to work superbly without detracting from the traditional look of the boat. "It's also been fascinating working with David and analysing the class rules in more detail. Traditional classes tend to follow a pattern purely on the basis that 'we've always done it like this', but this time, with David's help, each item was assessed against the Class Rules for opportunities to improve and innovate. Some of my ideas had to be modified, but with Simon and David's help we've navigated the mine field and I'm thrilled with the finished product. Whilst Geoff wanted innovation, he didn't want it at the expense of the traditional look of the boat. Many of the original wooden boats have beautiful varnished transoms and Geoff worked with Simon Hipkin and White Formula to create a system to allow a 4mm plywood "transom" to be inserted into the mould after the gelcoat was applied and before the boat was laminated. The result is a gleaming varnished transom that certainly makes this GRP boat extremely hard to distinguish from her wooden sisters on the water. Although 18 feet long, the forward end of a BOD cockpit can be quite crowded with two crew needing good coordination to get over the substantial centerboard case and duck under the kicker during manoeuvres. Already familiar with their use on sports boats Geoff opted for an above boom G-Nav instead of the conventional kicker used by the rest of the fleet. Having freed up cockpit space he now had much more leeway for locating control lines and sheet cleats. Another major issue for BOD crews has been the discomfort of sitting on and hiking out over lots of deck fittings, so Geoff ran jib and spinnaker sheets and the runner control lines through the deck with custom cleats on the edge of the cockpit combings to minimise those tell tale bruises. The devil is in the detail and many of Geoff's ideas took already proven systems and refined them. From a jib cunningham which leads through the bow fitting and down a watertight tube in the forward buoyancy tank into a cleat at the front of the cockpit allowing adjustment without sending a crew forward, to developing stainless steel centerboard winch components instead of the usual bronze, every item has been honed to perfection. He solved the occasional problem of the mainsheet, which traditionally runs under the boom above the helm, catching around the helm's neck by simply running it inside the boom until just aft of the turning block to the mainsheet cleat. One of the most unnerving moments in a BOD can be steering through a crowded weather mark rounding with just the very end of the tiller (which does not protrude far) clamped between your thighs and hoisting the spinnaker at the same time. 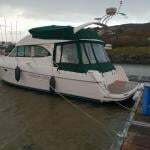 Having used pump action spinnaker halyards in the past, Geoff installed one on Never Say Never and it has proven very effective. Perhaps the most radical of all Geoff's ideas was the addition of self bailers in conjunction with a new flooring system in which fore and aft sealed floor compartments combine with narrow drainage channels along the centerline and outboard that force water to a drainage sump in line with the bailers. Previously the large shallow bilge prevented sufficient water depth/pressure for the bailers to operate well. So with all these innovations does Never Say Never stand out like a sore thumb when compared against the rest of the fleet? Most pleasingly the answer is no, she is as elegant and beautiful as her sisters and whilst Geoff's ideas will undoubtedly make her a joy to sail they do not improve boat speed. Never Say Never will join a fleet of 26+ active BODs that race at least twice a week from May to October from Brightlingsea Sailing Club and the Colne Yacht Club. Alongside the construction of Never Say Never, half a dozen older BODs have been undergoing signification refit and restoration work during the winter and the fleet is expected to be in fighting form by the time it gets to Pyefleet Week in early August, the highlight of the BOD year where once again it will be one of the largest classes racing. The 1897-built Fife-designed 37ft Belfast Lough One Design Tern has made a successful debut in the classics scene in the Mediterranean by winning her class in Les Voiles de St Tropez 2015 writes W M Nixon. We’ve reported from time to time on the Mallorca-based restoration project on Tern on Afloat.ie over the past 18 months. But we were keeping our fingers crossed that all would continue to go well after her successful launching on August 6th - so much effort was going into the final work and detailed finishing that, with time limited before she could be taken to the major regattas in the south of France, all and any sorts of hitches could still occur. Since then, there has been further concern with the weather in southeast France being exceptionally bad, with seriously adverse effects in recent days on the classic events in both Cannes and St Tropez. But Tern has not only come through unscathed, she has won her class overall despite the fact that there was only racing on two days at St Tropez, recording a first and second. This has all been hugely confidence-building for the team involved, and greatly improves the likelihood of Tern coming to Ireland next year. The Royal Ulster Yacht Club on Belfast Lough – which was her home club in her early days and still displays several photos of Tern and her six pioneering sisters from 1897 and 1898 - is celebrating its 150th Anniversary in 2016, while at different times Tern was also based in Cork Harbour, Waterford and Dun Laoghaire, and she was one of the five yachts taking part in the Founding Cruise of the Irish Cruising Club to Glengarriff in July 1929, giving Tern direct links with all of the Irish coast between West Cork and County Antrim, as she was built by Hilditch in Carrickfergus. When the new Belfast Lough ODs started racing in May 1897, it all happened so quickly that when sailmakers Ratsey & Lapthorne at their Scottish loft found that they lacked Tern’s allocated sail number 7, shortage of time meant they simply used an inverted 2 instead, and this has been faithfully replicated in the new 2015 sails, also made by Ratsey & Lapthorne. As well, the hull lines of the BLOD 25s from 1897 were then used for the building of the Dublin Bay 25s from 1898 onwards, though the Dublin Bay boats had a higher specification, and carried a lead ballast keel instead of the Belfast Lough boats’ less expensive cast iron. #kinsale – The May bank holiday event saw the inaugural 'Axiom sponsored One Design keelboat Regatta' held in Kinsale YC. Twelve Squibs and five Dragons came out to do battle for the very generous prizes and newly commissioned trophy. PRO Tony Ireson and his team provided great racing with 6 races held over the two days on a windward leeward course. Saturdays racing was held in 12-18 knots from the south west with the opening races in Dragons been taken by Little fella sailed by Cameron Good/Simon Furney and Henry Kingston. The Squibs were having a fierce battle with places at the top constantly been swapped with National Champion James Mathews in Mucky Duck, Colm Dunne and Rob Gill in Allegro and Finbarr and Cian O'Regan in Fagin. Kevin Downey knocked in a great day with 4, 4, 5 in his new squib Grey Matter. Day two saw the wind blowing from due south so Tony Ireson set his line at the mouth of the harbour. Lumpy seas and slightly lighter winds made for difficult sailing but Colm Dunne and Cameron Good found the groove and extended their leads with both finishing as overall winners. At the prize giving there was great excitement as to which boat would win the newly commissioned trophy and after the criteria was spelt out by sailing secretary John Stallard the first name to go on the trophy is Allegro sailed by Colm Dunne and Rob Gill. Such was the success of the event club Commodore Finbarr O' Regan was able to announce that Axiom Private Clients are to come on board for 2015 as the main sponsor and the dates were announced as May 2nd &3rd 2015. #smallboatforum – In anticipation of the small boat forum to be hosted next Saturday morning in the National Yacht Club, Roger Bannon has tried to gather some information over the last 2 years on attendance at class championships for dinghies and small keelboats. In Ireland we have about 20 recognised small boat and dinghy classes made up of single handed, 2 handed and 3 handed boats. Based on the data I looked at, approximately 700 boats participated in a National Championships with an average of 1,300 Irish competitors involved in 2012 and 2013. 22% were three handed keel boats and large dinghies. Assuming that most participants in singlehanded classes such as the Oppy, Topper and Laser Radial and 2 handed classes such as the Feva and Mirror are under 23 years of age, this group together with a few who were involved in other classes, made up about 40% of the total individuals involved. The active pool of remaining older competitive sailors involved in small keel boats and dinghies is less than 800 individuals! Nearly 500 of them raced in Mermaids, SB20s Shannon One Designs, Squibs, National 18s and Flying Fifteens with less than 300 people sailing other more performance oriented classes. Clearly this is not indicative of the numbers involved in club and other recreational small boat sailing activities but it is a very stark analysis of the current competitive situation for so called prestige events! The harsh reality in Ireland is that we probably have fewer adults racing small boats competitively in recognised championships all year than sail on any Thursday evening in Dublin Bay Sailing Club! Even if the figures are wrong by 50% the message remains materially the same. With exception of a small number of established classes, competitive small boat sailing in Ireland is clearly on its knees. How can we reasonably expect to produce world class sailors from this modest environment? The scope of the challenge is awesome! #ISA - The Irish Sailing Association has issued an open invitation to dinghy sailors to discuss the future of dinghy and one design racing in Ireland at a special meeting less than two weeks away. The Dinghy & One Design Keelboats Convention will take place on Saturday 2 November at 10.15am in the JB Room at the National Yacht Club in Dun Laoghaire. Chaired by Margaret O'Donnell, the convention follows on from the classes forum this past March, which led the ISA Board to establish a Dinghy/One Design Racing Advisory Group. That meeting also prompted Ric Morris' suggestions for five things the ISA could do to rejuvenate dinghy sailing in Ireland. His salient points will surely provide much fodder for discussion on the day. Do Ireland's One Design Sailing Classes Need A 2014 Pop–Up Regatta? #onedesignsailing – Pop-up shops, pop-up restaurants – they're everywhere. Or if they're not exactly everywhere, at least we've seen enough of them to know that the idea has a certain appeal when traditional ways of doing business have suffered in recession, with out-of-town multiples knocking the traditional retail trade for six. So who's on for a pop-up regatta? As we slip into the Autumn leagues and look back on one of the best and busiest Irish sailing seasons in years, it only serves to emphasise the fact that the programme for next year is so quiet as to be almost invisible. Oh for sure it's a Round Ireland Year, and with the late-June circuit from Wicklow having added status through its extra points for the RORC Championship, we're probably going to be seeing something even more high powered than last time round in 2012. And there'll be Cork Week in July too. The gallant Corkmen swung with the punches back in 2012. When they realised that their sailing megafest of the boom years was going to be recession-shrunk and then some, the notion of describing it as "small-but-perfectly-formed" did the business until some genius came up with the concept of the Boutique Regatta, which seemed such an attractive idea – and it gave great racing – that maybe they'll air it again for next year. As for the ICRA Nationals, they're scheduled for the Royal Irish YC in Dun Laoghaire from 12th to 15th June. It's a star venue with the club's prime position on Ireland's biggest marina, while the immediate access to a large fleet in an area where cruiser-racing is a significant part of life afloat virtually guarantees the event's success. As a bonus, the fact that the Round Ireland starts a week later makes for a very attractive proposition for visiting boats who might like to get a lot of quality racing under their keels before June is out. On the cruising front, the Irish Cruising Club will be celebrating its 85th birthday with a week long Cruise-in-Company in West Cork in early July, culminating in a grand finale at Glengarriff on July 13th, which is exactly 85 years to the day since this unique club came into existence. They're limiting numbers to 85 boats, but with the invitation extended to associated cruising clubs overseas, it could well be that this impressive total will be reached. So perhaps it's an exaggeration to talk of next year's programme as being empty. But it's certainly sparse compared to 2013's seemingly endless and brilliant tableau, which included three world championships with the Mirror Worlds on Lough Derg, the J24 Worlds at Howth, and the International Association For Disabled Sailing Worlds at Kinsale. There were also the well-attended Volvo Dun Laoghaire regatta, and the rolling celebrations of the Old Gaffer's Association Golden Jubilee which brought classic and traditional boats to Dublin and Belfast. Glandore Classic Regatta followed soon after, while offshore the biennial Dun Laoghaire-Dingle Race had brought boats to the Kerry coast for the storm-harried yet successful ICRA Nationals, followed soon after by the Sovereigns Cup in Kinsale. As for dinghies, while some classes faltered, the huge turnout for the Laser Europeans at the National YC this month emphasised the enduring appeal and popularity of Bruce Kirby's timeless gem of a design. It really has been a vintage year. But by and large, where the more prominent events featured racing, it was cruiser-racing which was dominant. And Ireland's enthusiasm for this branch of sailing received something of an international boost recently with the RORC measurement office praising the way in which we have successfully combined full-on IRC competition with the less extreme rating system provided by ECHO. But it may well be that the unique situation of Dublin is the key to all this. The relatively limited weekend cruising options in the Dublin Bay area, and the fact that so many sailing folk live within a few minutes of their boat's berth, means that on a Saturday afternoon, and even more so on a Thursday evening, Dublin Bay SC is mustering impressively large fleets of cruiser-racers including many boat types which - in any other area - would not be thought of at all in the racing context. Yet DBSC can offer this attractive package of guaranteed sport in a very manageable time and travel package. Anyone who thinks that racing a comfortable cruiser is not really sport at all is much mistaken. There's a special challenge to it – getting the best possible performance out of a boat which provides genuine liveaboard amenities is extremely satisfying. And in the Dublin context of sociable sailing, there are many who pop down to Dun Laoghaire harbour for the convenient promise of a race sailing with friends, people who might not otherwise sail at all. And they certainly wouldn't dream of having a small boat of their own, and racing in a one design class. The hassle and the discomfort, not to mention the extra physical demands and expense, can make for a very unfavourable comparison with crewing on a cruiser where able and congenial crewmembers are always welcome. But one design racing is an equally valid form of our sport, and in compiling a list of boats which can provide one design sport in Ireland, we were astonished to find the figure hitting the 39 mark. As for the variety of boat types, eclectic only begins to describe it. Most will be familiar, but some are gloriously unknown. The Ballyholme Bay, for instance, is a 21.75ft cabin sloop from around 1936, built in Scotland. Over the years the original nine boats were depleted by storm damage in their home anchorage, but there are still some around and the word is three are currently afloat and lining up for Ballyholme YC's traditional end-of-season pursuit race this Saturday for the Lufra Cup. The Ette class are clinker-built dinghies based in Castletownshend, so named because all their names end in "ette". As for the Heir Island 24s, they're also found around West Cork, built of GRP and with their design inspiration drawn from both the North Wales Seabird Half Raters, and the traditional Heir Island yawls. The Fairy Class of 1902 onwards is found both on Belfast Lough and Lough Erne, and this summer while sailing through the RNIYC anchorage at Cultra, it was intriguing to compare them with the relatively new boats of the RS Elite class, which is in its turn a very miniaturised derivative of the last America's Cup keelboat class. ....but their sister-ships on Lough Erne have stayed with the original gunter rig. The Flying Fifteens hold sway at several centres, but it's interesting to note that in Dun Laoghaire they buck the trend of being spread across all the waterfront club, as the FFers are exclusively sailors from the National YC. This may be one way to hold a class together against the many temptations to move to new boats that Dun Laoghaire offers, but another way of sustaining a class is to have it based on a peninsula of land or water. A water peninsula? Well, how else would you describe Strangford Lough? Not only is it connected to the rest of the sea by a thin isthmus of water, but these Narrows are so tide-riven that Strangford Lough exists in a state of splendid isolation in which eccentricity thrives, and local ways of doing things hold sway. Thus two local one design keelboats are dominant. The 25ft Mylne-designed Glens may have a sister class in Dun Laoghaire, and a couple of the boats may have ventured out of the Lough to go to the Mylne regatta in the Clyde a few years back, but their more senior cousins, the 29ft Rivers of 1919 vintage, haven't deigned to leave Strangford Lough since 1951, when they sallied forth to Belfast Lough for the Festival of Britain Regatta Week. The dozen or so Rivers (nobody knows what happened to Number 4) have been saved from terminal decline by occasional bursts of fresh enthusiasm, one of the key movers being Kenny Smyth of Whiterock Boatyard, who found Laragh in a field in a state of dilapidation. He made such a lovely job of restoring her that the class revived, a recent recruit to the ranks of the owners being Brian Law, better known for his offshore racing feats in the trimaran Downtown Flyer. But despite other talents in the class, Kenny Smyth is still the man to beat, and they've had a good year in 2013, with ten of these interesting veterans making the start line. But the likelihood of any River class boat ever leaving Strangford Lough to attend a regatta elsewhere is unlikely, and they're so absorbed in their own contented competition that it's unlikely they'd wish to inspire their home club of Strangford Lough YC at Whiterock to host a come-all-ye regatta for several one design classes. So really it comes down to Dun Laoghaire if any venue is going to host a pop-up one design regatta next year. They already have half a dozen classes within the harbour, they invented the one design concept in 1887 with the original Water Wags, and it shouldn't be too difficult to entice the two significant one designs across the bay from Howth, the land peninsula which is another OD stronghold. The Puppeteer 22s and the Howth Seventeens both draw their strength from the peninsula's vibrant sense of community. But both classes have been known to venture forth from time to time, with 15 of the Howth 17s managing to get to Glandore Classics back in 2003. This past summer, two of them went even further afield, with the 2013 champion, the syndicate-owned Deilginis, and Ian Malcolm's 1898-built Aura, being road-trailed to the Classic One Designs Regatta in Cowes. In terms of numbers, the event was of course dominated by the Solent Sunbeams and the famous X One Designs, but the two little boats from Ireland carried their jackyard topsails with notable style, and Aura won the gaff-rigged class. Yet the Howth Seventeens are just one class among many within easy reach of Dun Laoghaire harbour. But although next year's programme of major events doesn't look at all crowded, the dates will soon be filled. So anyone with the notion of a one designs special regatta should make it pop up soonest. #VOR - North Sails has revealed its sail wardrobe for the new one design VOR 65 with less than 18 months to go before the latest Volvo Ocean Race sets sail. As The Daily Sail reports, the sails will be manufactured at North Sails' Nevada base using its 3Di process in a range of deniers, except for the A3 and storm jib. Sails will be constructed in batches to ensure the same mould is used for eight sails of one type. The sails will then be finished at Vannes in France before being paired up with their respective vessels, assembly of which is racing ahead. Perhaps most importantly, each team competing will have the use of just 12 sails - only eight of which will be allowed on board for each leg of the race. No recuts will be allowed except for repairs, in order to maintain the fairness of the one design principle. “Our main objective is to make a really durable sail that holds its shape and stays together for as long as the race needs it to stay together," said North Sails general manager Jeff Neri. The Daily Sail has more on the story HERE. #VOR - The Volvo Ocean Race team caught up with Ireland's own Damian Foxall on board Sidney Gavignet's MOF 70 yacht Oman Sail with fellow VOR veteran Neal McDonald. As reported in March on Afloat.ie, Ireland's top offshore sailor - and watch-leader for last year's VOR-winning team Groupama - is part of an international crew that attempted to break the Round Ireland speed record that was unfortunately abandoned due to the harsh wintry conditions. But Foxall vowed that a repeat attempt is on the cards, and tells the VOR website that his experience on Oman Sail "is exactly what I wanted to do after the Volvo. I just wanted to sail with a smaller team of friends, racing with a good crew." Foxall also sings the praises of the MOD 70 one design, heralding the future of the Volvo Ocean Race and the new VOR 65 yacht. "It’s light in terms of logistics and repairs. On the water too, I’m looking forward to enjoy the best of the One Design sailing – the battle on the water and not in the boatyard." #Laser - The sailing world has been taken by surprise with the news that the designer of the Laser has launched his iconic design under a whole new brand amid allegations over royalty payments. Bruce Kirby - whose single-handed one-design has become a staple at the Olympic Games - has apparently signed all new builder agreements to manufacture his rechristened Kirby Torch design, after terminating his previous deals at the end the last year. "The issue is supply of the Kirby sailboat and parts to sailors worldwide," according to the Kirby Torch website. "After numerous attempts, Bruce Kirby felt he had no choice but to withdraw Laser brand building rights in North America and Europe." It's alleged that lack of royalty payments for the design by at least one top manufacturer prompted the move by Kirby to strike out on own, but nothing has been confirmed as of this time. It is also not known exactly what the consequences will be for currently sailed Lasers and for the International Laser Class Association (ILCA), although the Kirby Torch website states that all ISAF-plaqued Lasers are class legal under the renamed fleet.